I’m not sure about you, but I have always used mushroom and fungus interchangeably. That’s not to say that is incorrect; mushrooms are considered fungi (or funguses, your choice), as are yeasts and molds. Perhaps the famous line by Dr. Egon Spengler from the original Ghostbusters, “I collect spores, molds, and fungus” comes to mind – turns out he was talking about a group of organisms that are all closely related. Whether you’re into looking at fungi under a microscope like Egon or not, there is quite a diversity of fungi at any scale, whether it’s the Richmond Field Station, Northern California or world wide. Only a very small portion (120,000) of the estimated 2.2-3.8 million species in Kingdom Fungi have been described by taxonomists. The range of colors (nearly every color except green, as they don’t photosynthesize), shapes, mechanisms to release spores, and how they grow whether in clusters or individually, is nearly overwhelming when you start investigating this fascinating group of organisms. While I have seen my fair share of mushrooms, from ones that look like they should be in a Disney movie with a talking caterpillar on top, to delicate, nearly-translucent groupings growing in the redwood forest, one species recently caught my attention at Point Pinole–the turkey tail mushroom (Trametes versicolor). These are in a group called bracket fungi, as they grow in layers sticking out from both alive and dead trees like shelves or brackets, flat on top and angular underneath. This group of fungi play a key role in the decomposition of wood, which is why you can often find them on tree stumps or fallen tree trunks in thick forested areas. 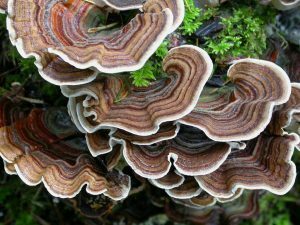 Turkey tail mushrooms get their common name from the rings of colors on the top of each fruiting body, in a color scheme that resembles those turkeys — rusts, browns and blacks mostly. Algae has been known to grow on these too, adding in some green to the mix (which you wouldn’t necessarily find on real turkeys). When starting my research on turkey tail mushrooms, the first few pages of results weren’t what I expected. Many of the first links that popped up discussed turkey tail mushrooms as additives or adjuncts to cancer treatments, as immune-boosting supplements, and Amazon links to buy 120 mushroom capsules for $45. In doing a little more research, I came to discover that there is a compound in turkey tail mushrooms called polysaccharide K (PSK) that is going through tests and trials to see if it could be used in cancer treatments, but there have been no published studies showing positive results. As far as I could tell, people don’t eat turkey tail mushrooms in the same way that we eat portobellos or morels. While these beautiful bracket mushrooms grow well-sized fruiting bodies, they don’t seem to be harvested and eaten raw, so I suppose we’ll have to wait a little longer to find out if these mushrooms possess other qualities and compounds only science can unlock. Many mushrooms and fungi have been used for centuries in food and folk medicines, whether as an agent in bread-making or cheese-making, or as a topping or ingredient in salads and soups, among many other dish options. There is certainly a wide range of tasty edible mushrooms, just as there is a wide range of species that are poisonous to humans, causing anything from an allergic reaction to hallucinations, organ failure and death. 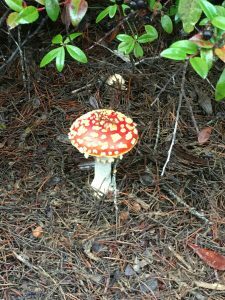 So before you decide to take your truffle pig out into the woods to find the next high-demand market mushroom, be sure to investigate what will give you hallucinations versus a satiated stomach. Hawksworth LD, Lucking, R (July 2017). “Fungal Diversity Revisited: 2.2 to 3.8 Million Species”. Microbiology Spectrum. 5(4): 79. Mueller GM, Schmit JP (2006). 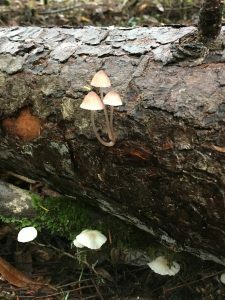 “Fungal biodiversity: what do we know? What can we predict?” Biodiversity and Conservation. 16: 1-5.